Vagaries withdraws SWM from Central Sindh (Pakistan) and West Rajasthan. As early as mid-August, Vagaries had put up a poll, predicting SWM withdrawal around 1-5th September, and a mojority of the votes cast was against the prediction. "Later" and "do not agree" dominated the votes. On 13 th September, Vagaries re-estimated the withdrawal date to 17th September. Latest charts show the 200 mb jet streams have turned westerly in the Central Pakistan and adjoining Rajasthan region, and rushing along Northern India as west winds. 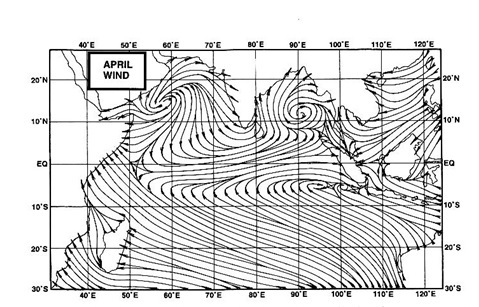 The 850 chart depicts the humidity dropping in the mentioned region, and a weak ridge formed over the region. Though the anti cyclone is not pronounced, situation is sustainable as a post monsoon scenario. Bikaner and western Rajasthan cities to show a rise in day temperatures to over 38c from tomorrow. Karachi was 32c today, but expected to rise to 34/35c in the next 2 days. Other cities in Sindh can rise to over 40c from tomorrow. Current indications show the SWM further withdrawing from rest of Sindh, Kutch and Central Rajasthan and parts of Punjab in the next 48 hrs. Meanwhile, in the East, BB-7 is fizzling out by tomorrow in the Sikkim/W.Bengal region. Another low, at 1000 mb could possibly form in Bangladesh in the next 36 hrs. May not last long, but long enough to precipitate fairly heavy rains on Monday/Tuesday in Bangladesh, adjoining Bengal (Kolkatta), Sikkim and Maghalaya. Cherrapunji could catch up to some extent on its lagging total. Maharashtra will have thundershowers "popping up" in the evening. the "lifted index" drops after 21st sep in mumbai. can you please explain what is the cause for this happening? The CAPE levels are also down - the morning's 00z GFS runs show CAPE levels around Mumbai of 100 j/kg which is fairly low. Also the 700 mb charts show precipitation dropping drastically across the Country except some parts of the West Coast, Mumbai is shown to recieve some rains (though not much) but Southern India is completely dry (slightly odd). Looks like the SWM may beat a hasty retreat.